A unique blend of oils designed to promote a positive attitude, peace, happiness, emotional support, alleviate depression and negative thoughts. Also promotes joy, optimism, uplifting of spirits and brings balance and well-being. A powerful oil blend with anti-septic, anti-viral, anti-bacterial, anti-infectious and anti-parasitic properties. Designed to discharge toxins, regenerate tissue, provide purification and stimulate immune function. Ingredients: lemon, tea tree, rosewood, clove, oregano, spruce, cinnamon, hyssop, cassia, frankincense, rose. A special oil blend designed to reduce anxiety and promote peace, calmness, relaxation, and gentleness. Also reduces stress and tension while calming the emotions and producing sedation. Ingredients: lavender, peppermint, rosewood, tangerine, spruce, marjoram, patchouli, bergamot, basil, rose, neroli. 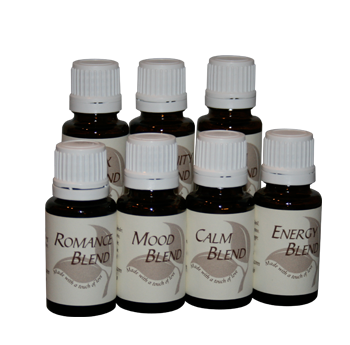 An oil blend designed to balance both male and female sexual energies. Provides natural aphrodisiac properties. Promotes positive hormonal effects, feeling of eroticism and sexual stimulation while reducing anxieties and stress in relationships. Ingredients: orange, rosewood, jasmine, ylang ylang, sandalwood, rose, neroli. A powerful oil blend designed to promote physical energy, inspiration, reduce fatigue, and provide support for the adrenal glands. Ingredients: lemon, basil, blue cypress, lemongrass, nutmeg, jasmine, ginger, clove, rose. A cleansing oil blend designed to discharge toxins, purify and cleanse the blood and body. Helps burn fat and provide liver support. Ingredients: spearmint, lemon, fennel, geranium, juniper, cinnamon, blue tansy, helichrysum, hyssop, patchouli, roman chamomile, rose. This unique oil blend is designed to uplift and stimulate the mind, alleviate mental fatigue, encourage concentration and sharpen the senses. It also contains oils to open the mind, increase oxygen to the brain, and balance and harmonize the right and left hemispheres of the brain. Ingredients: rosemary, peppermint, myrrh, white fir, blue cypress, basil, frankincense, sandalwood, rose.